Sleep in true comfort on the worlds most comfortable fiber, Alpaca fiber is great for severe allergy sufferers sensitive to other fiber such as wool or feathers or foam, since this is made right here at Featherz Nest we are not mandated to add chemicals as a fire retardant like the pillows you purchase in retail stores. There are no chemicals or lanolin like in wool, we use only 100% Alpaca fiber in a hypoallergenic, anti-microbial, 400 thread count cotton cover. 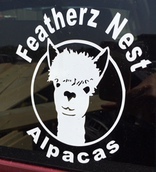 Alpaca is a natural fire retardant fiber. Alpaca fiber is a rounded hollow core fiber and it is breathable and regulates tempature for the most comfortable pillow available.